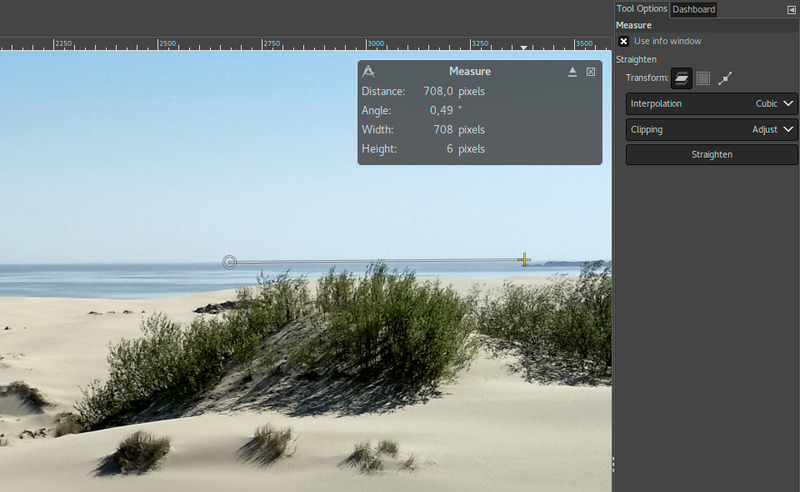 A common use case for the Measure tool is getting GIMP to calculate the angleof rotation, when horizon is uneven on a photo. GIMP now removes the extra stepof performing rotation manually: after measuring the angle, just click thenewly added Straighten button in the tool’s settings dialog. Loading all available fonts on start-up can take quite a while, because as soonas you add new fonts or remove existing ones, fontconfig (a 3rd party utilityGIMP uses) has to rebuild the fonts cache. Windows and macOS users suffered themost from it. Thanks to Jehan Pagès and Ell, GIMP now performs the loading of fonts in aparallel process, which dramatically improves startup time. The caveat is thatin case you need to immediately use the Text tool, you might have to wait tillall fonts complete loading. GIMP will notify you of that. Michael Natterer introduced some internal changes to make fonts taggable.The user interface is the same as for brushes, patterns, and gradients. GIMP doesn’t yet automatically generate any tags from fonts metadata, but thisis something we keep on our radar. Ideas and, better yet, patches are welcome! Ell added several new features to the Dashboard dockable dialog that helpsdebugging GIMP and GEGL or, for end-users, finetune the use of cache and swap. New Memory group of widgets shows currently used memory size, the availablephysical memory size, and the total physical memory size. It can also show thetile-cache size, for comparison against the other memory stats. Updated Dashboard in GIMP 2.10.4.Note that the upper-bound of the meter is the physical memory size, so thememory usage may be over 100% when GIMP uses the swap. The Swap group now features “read” and “written” fields which report the totalamount of data read-from/written-to the tile swap, respectively. Additionally,the swap busy indicator has been improved, so that it’s active whenever data hasbeen read-from/written-to the swap during the last sampling interval, ratherthan at the point of sampling. While we cannot yet support PSD features such as adjustment layers, there is onething we can do for users who just need a file to render correctly in GIMP.Thanks to Ell, GIMP now can load a “merged”, pre-composited version of theimage, that becomes available when a PSD file was saved with “MaximizeCompatibility” option enabled in Photoshop. This option is currently exposed as an additional file type (“Photoshop image(merged)”), which has to be explicitly selected from the filetype list whenopening the image. GIMP then will render the file correctly, but drop certainadditional data from the file, such as channels, paths, and guides, whileretaining metadata. Beta builds of GIMP 2.10 for macOS are available now. We haven’t eliminatedall issues yet, and we appreciate your feedback. Ell further improved the Recursive Transform operation, allowing multipletransformations to be applied simultaneously. He also fixed the trimming oftile xache into the swap. 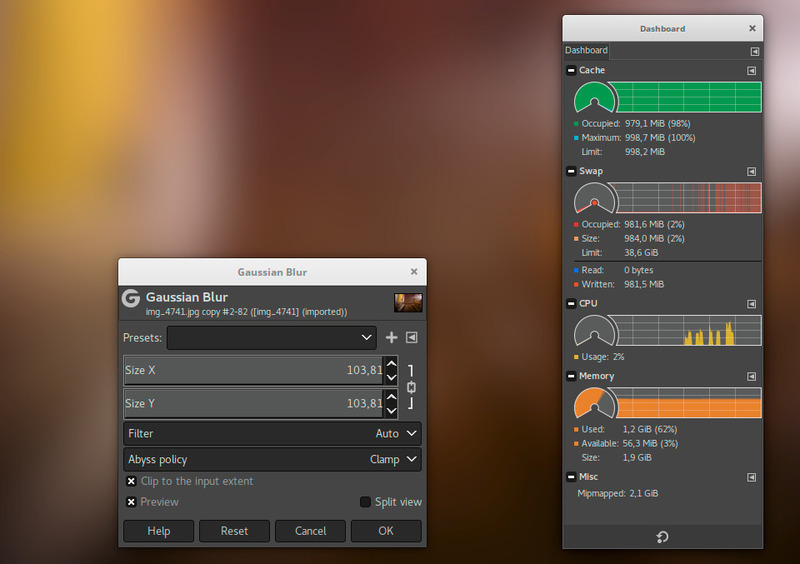 New Selective Hue-Saturation operation by Miroslav Talasek is now available inthe workshop. The idea is that you can choose a hue, then select width of thehues range around that base hue, then tweak saturation of all affected pixels. Øyvind Kolås applied various fixes to the Pixelize operation and added the“needs-alpha” meta-data to Color to Alpha and svg-luminancetoalphaoperations. He also added a Threshold setting to the Unsharp Mask filter(now called Sharpen (Unsharp Mask)) to restore and improve the legacyUnsharp Mask implementation from GIMP prior to v2.10. In babl, Ell introduced various improvements to the babl-palette code, includingmaking the default palette initialization thread-safe. Øyvind Kolås added anR~G~B~ set of spaces (which for all BablSpaces mean use sRGB TRC), definitionsof ACEScg and ACES2065-1 spaces, and made various clean-ups. Elle Stonecontributed a fix for fixed-to-double conversions. While we spend as much time on bugfixing in 2.10.x as we can, our main goalis to complete the GTK+3 port as soon as possible. There is a side effect ofthis work: we keep discovering old subpar solutions that frustrate us untilwe fix them. So there is both GTK+3 porting and refactoring, which means wecan’t predict when it’ll be done. Recently, we also revitalized an outdated subproject called ‘gimp-data-extras’with the sole purpose of keeping the Alpha-to-Logo scripts that we removedfrom 2.10 due to poor graphics quality. Since some users miss those scripts, there is now a simple way to get them back: download gimp-data-extras v2.0.4, unpack the archive, and copy all ‘.scm’ filesfrom the ‘scripts’ folder to your local GIMP’s ‘scripts’ folder.